Frontiers Records is pleased to announce the release of ASIA’s newest live package "Resonance" on November 23rd in Europe and November 27th in North America to coincide with the band’s forthcoming tour. 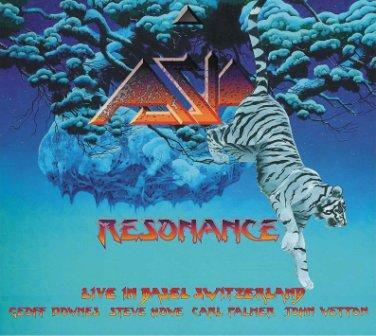 Recorded on May 4th 2010 in Basel, Switzerland, this new ASIA live 2CD / DVD captures the band, featuring the original line-up of Geoff Downes, Steve Howe, Carl Palmer and John Wetton in front of an ecstatic audience during one of the shows on the “Omega” World Tour. Filmed with 18 HD cameras, this live recording is truly a rewarding experience for all ASIA fans. After the polished Japanese DVD "Fantasia", ASIA released ’Spirit of the Night’ from the Cambridge Festival two years later. ’Spirit’ was a high-energy, end-of festival document. This is Asia resonating the Z7 on an “Omega” night in Central Europe: “ASIA live on the road, in-your face and for your pleasure,” says John Wetton. The set list features songs from their first two reunion albums “Phoenix” and “Omega”, along with a selection of the classics from the 1982 debut album and their 1983 follow-up Alpha. The recording is a historical document of where the band was at the time and a snapshot of their musicianship, camaraderie and passion. This live 2CD / DVD is released exclusively in a lavish digipak edition and is an irreplaceable companion to the studio album. Cd1: I Believe; Only Time Will Tell; Holy War; Never Again; Through My Veins; Don't Cry; All’s A Chord; The Valley Of Rocks; The Smile Has Left Your Eyes; Open Your Eyes. Cd2: Finger On The Trigger; Time Again; An Extraordinary Life; End Of The World; The Heat Goes On; Sole Survivor; Go; Heat Of The Moment. Dvd: I Believe; Only Time Will Tell; Holy War; Never Again; Through My Veins; Don't Cry; All’s A Chord; The Valley Of Rocks; The Smile Has Left Your Eyes; Open Your Eyes; Finger On The Trigger; Time Again; An Extraordinary Life; End Of The World; The Heat Goes On; Sole Survivor; Go; Heat Of The Moment.